A source defines a set of configuration parameters for one or more Google Sites for one Google Apps account. You have more than one Google apps account to manage your Google Sites domains. One source Google Sites associated with a private Google account. Select the connector used by this source. In this case, select Google Sites. Note: If you do not see Google Sites, your environment does not meet the requirements (see Google Sites Connector Requirements). The Google Sites returned by the auto-discovery feature are the ones to which the connector was granted access to when the OAuth2 refresh token was generated. Only auto-discovery of all accessible sites within a single domain is supported, not for all domains of a specific Google Apps account. The auto-discovery only returns sites with sharing permissions explicitly allowing the crawling user; it does not return sites allowing everyone from the domain nor does it consider administrator permissions which grants access to all web sites of the Google App domain. Select the field set that you created earlier (see Google Sites Connector Deployment Overview and What Are Field Sets?). CES 7.0.7256– (December 2014) Enter the path to the default mapping file that defines how the connector handles metadata. You can leave this box empty, in which case no Google Sites metadata will be indexed. CES 7.0.7104– (October 2014) If you create a custom mapping file, enter the path where you saved your file on the Coveo server (see Creating a Custom Google Sites Connector Mapping File). You can leave this box empty, in which case no Google Sites metadata will be indexed. Enter the Client ID value that you got earlier (see Getting Google Sites Client ID and Client Secret values). Enter the Client Secret value that you got earlier (see Getting Google Sites Client ID and Client Secret values). Enter the OAuth2 refresh token value that you got earlier (see Getting a Google Sites OAuth2 Refresh Token). Click Add Parameter when you want to show and change the value of advanced source parameters (see Modifying Hidden Google Sites Source Parameters). When you chose to index Google Sites permissions, in the Security Provider drop-down list, select the Google Sites security provider that you created for this source (see Configuring a Google Sites Security Provider). 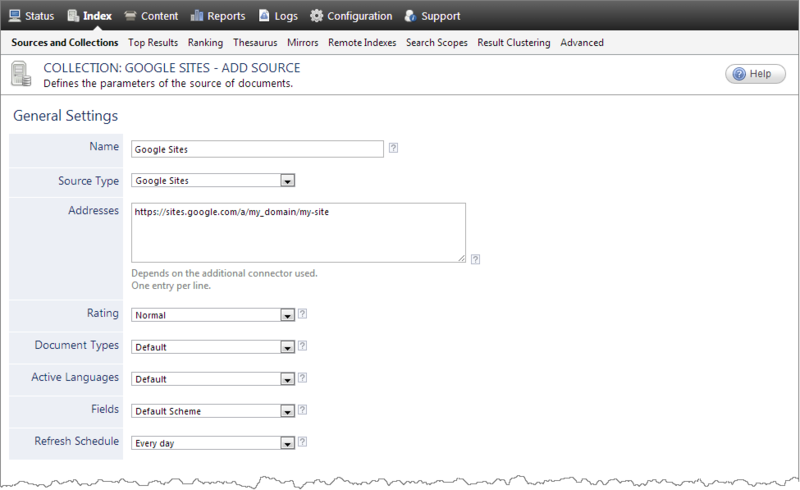 In the User Identity drop-down list, select the user identity that you created for this source (see Google Sites Connector Deployment Overview). In the Allowed Users and Denied Users boxes, enter the users and groups that you respectively want to allow or deny to see search results from this source. The default is to allow everyone (Active Directory Group). When you are ready to start indexing the Google Sites source, click Rebuild. Consider modifying some hidden source parameters to try resolving issues (see Modifying Hidden Google Sites Source Parameters).